Insane Clown Posse is closing in on being a hip hop dynasty that’s 30 years strong. Born in Detroit in 1989, ICP-mania seemed to kick off with the 1992 release of Carnival of Carnage, their debut album. I’m not sure if it’s because I grew up in the midwest, so we were vaguely close to Detroit, or what, but it seemed like by the time The Great Milenko rolled around in the late 90’s, everyone knew ICP. Since then, the band has been parodied number of times including on Saturday Night Live and on Workaholics (among many others) and their fan following seems like it’s only getting stronger. I’ve been to a number of Insane Clown Posse shows, and honestly, they’re unlike anything else on this planet. Imagine listening to music so loud you can’t hear yourself think, while you’re being soaked to the bone in soda sprayed from the stage, surrounded by the nicest people you will ever meet. I don’t even particularly like ICP’s music, but I love their concerts. Juggalos (ICP fans) all consider each other family, and treat each other accordingly. It’s real, real weird experiencing this first hand- Particularly if your whole understanding of juggalo culture is based on stereotypes and assumptions. Insane Clown Posse seems to just be constantly touring, but the crown jewel of their entire schedule is the Gathering of the Juggalos, hosted annually around this time every year. It actually just started today, and to coincide with the gates opening at The Gathering, the iPhone game ICP: The Gathering ($3.99) launched on the App Store. 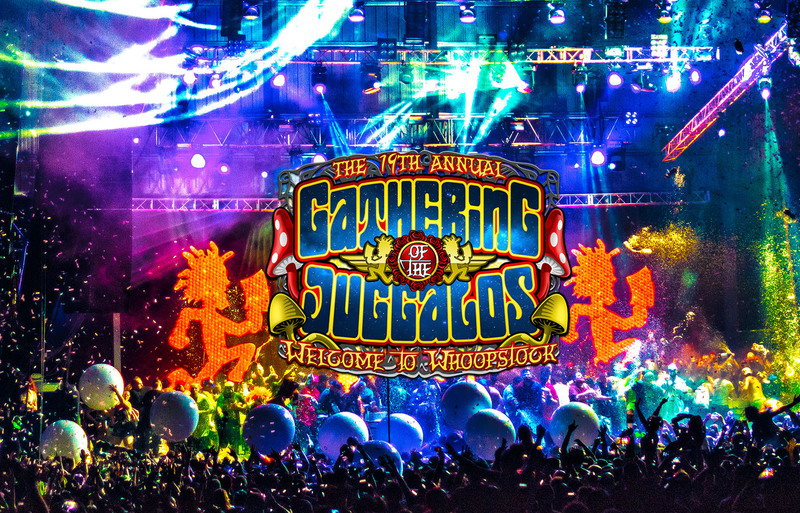 From a 40,000 foot view, ICP: The Gathering is trying to be the juggalo equivalent to RollerCoaster Tycoon Classic ($5.99). In the game, you build out your own Gathering, complete with setting up stages, booking both musical and comedy acts, deciding where toilets go, pricing hot dogs, and other similar things. The problem is, the game is just bad. [UPDATE: The developers have reached out to us, read more here.] Not even in an amusing or ironic way that simulating your own juggalo Gathering might be bad, but still redeeming because it’s so silly- I mean just mechanically bad, from top to bottom. It really bums me out, as you can tell the developers are trying really hard when it comes to shoveling heaps of fan service into the game, it’s just executed in a way that’s so difficult to play, that even just enjoying it for the fan service is borderline impossible. For instance, I love the idea of unlocking different performances from the Psychopathic Records universe and then figuring out the optimal scheduling for your own Gathering, but the UI is so unbelievably cumbersome I almost gave up on this part of the tutorial as dragging and dropping acts on to the schedule requires a level of surgical precision that’s unlike anything else I’ve experienced on the platform. The rest of the game follows a similar path, with wonky touch controls, weird UI elements, and gameplay that just doesn’t make a ton of sense. It’s too bad too, as you can definitely see the direction they’re going. I’m just not sure if the release of the game was super rushed to coincide with The Gathering of the Juggalos or what, but it makes no sense to me as ICP: The Gathering was developed by Flight Systems, who are also responsible for a number of really good flight simulator games like Flight Unlimited X ($0.99). I’d understand if this was some low-budget cash-in from some no-name developer like we’ve seen countless times before, but this is from a real studio. I seriously just don’t get it, to the point that I’m almost surprised that ICP: The Gathering was approved by Apple from a functional standpoint. Trailer Park Boys: Greasy Money (Free) has proven that you can take a weird, borderline niche IP and turn it into an amazing game- both for fans and people who have never heard of the source material before. There’s a huge opportunity to make a builder based on The Gathering of the Juggalos that’d actually be really fun to play. UPDATE: The developers of ICP: The Gathering reached out to say they’ve been working around the clock to update and improve the game. Specifically, the control problems I mentioned are being fixed in an update that should be available tomorrow which reduces the overall control sensitivity of controls and offers a secondary “tap" input method.